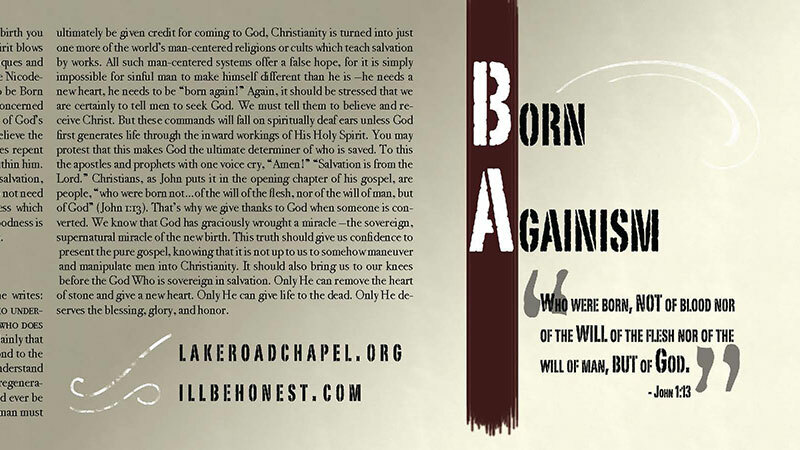 3 x Free Gospel Tracts – God’s Answers | The Gospel | Are You Born Again? Free Arabic Gospel Tract – How Can A Man Be Right With God? There is much talk these days about the rapid growth of the cults. Jehovah’s Witnesses, Christian Science, Mormonism, the Unification Church, and a host of lesser-known groups are making converts at astounding rates. Yet, the combined effect of all these groups is over-shadowed by a movement that in the last few years has grown to include over 30% of the U.S. population. The amazing development of what might be called “Born-againism” is affecting all sectors of our society. In fact, if the latest figures presented in the religious polls are accurate, the current Born-again phenomenon could well be viewed as the fastest growing cult in America. Born-againism has permeated the fundamentalist denominations as leaven in dough, and expanded into the culture at large. Candidates espouse it in order to get votes, entertainers use it to attract crowds, pro-football players proclaim it to give respect to their Sunday afternoon brutality, and the business world promotes it in order to make money. Even the secular press, radio, and T.V. have found it fashionable to occasionally slip the little words “born again” into their speech and print. That the world has jumped on the Born-again Bandwagon in order to exploit it is sad but not surprising. We really shouldn’t expect anything else from the spiritually blind worldling. The real tragedy is that this whole mess was spawned and spread by the “Church” and is now lauded as a great revival of Christianity. The truth is that much of contemporary evangelicalism, like the church of Sardis, appears to be alive, but actually is dead (Rev. 3:1). And we can’t blame the atheists, the agnostics, or the liberals for this condition. No, the fault lies with the supposed “Bible believers.” Error has been preached as truth and propagated with cultish zeal. As a result multitudes have believed a lie and are headed for hell from fundamentalist church pews with a Bible in their hands and a prayer on their lips. Many others have become disillusioned with all the hypocrisy and false “fulfillment,” and have concluded that there is really nothing to this “born-again” stuff after all. In the third chapter of John’s Gospel, Jesus tells Nicodemus, “You must be born again.” What did the Lord mean by this statement? First of all, it should be noted that Jesus said nothing of any action or decision that Nicodemus must make, nor did He even tell him to repent and believe the gospel. As a matter of fact, Jesus was not telling Nicodemus to do anything! “You must be born again” was not a command Nicodemus was to obey, it was simply a statement of fact. Nicodemus, in his blindness, misunderstood this statement and asked how anyone could do such a thing as that — a man “cannot enter a second time into his mother’s womb and be born, can he?” To this Jesus said in effect, “I’m not talking to you about you doing anything, I’m talking about God doing something.” “I’m talking about the Spirit of God coming and miraculously generating life in you. You being flesh can only produce flesh. Only the Spirit of God can produce the spiritual birth you must have in order to enter the Kingdom of God, and God’s Spirit blows where He wishes” (John 3:1-8). The modern evangelist’s techniques and teaching are conspicuously absent in this account. The Lord gave Nicodemus no “Four Spiritual Laws,” nor any instructions on “How to be Born Again,” and He certainly used no manipulative tricks. He was concerned to emphasize just one thing. Regeneration is a miraculous work of God’s Spirit. We can, and must, tell men to turn from their sins and believe the Gospel, but in doing this we should realize that when a man does repent and believe, it is the result of God’s prior regenerative working within him. If this were not the case, if man must actually initiate his own salvation, then it would be impossible to escape the conclusion that men do not need regeneration at all, but possess in themselves an innate goodness which causes them to seek after God. Though it be ever so slight, this goodness is then the ultimate reason why one man is saved and another is lost. But the Apostle Paul clearly teaches the contrary when he writes: There is none righteous, not even one; There is none who understands, There is none who seeks for God… There is none who does good, There is not even one (Romans 3:10-12) Here Paul states plainly that there is no “spark of goodness” in man that causes him to respond to the gospel. In fact, man, blinded by sin and Satan, does not even understand the gospel. He is in total rebellion against God and His truth. If regeneration were contingent upon man first desiring God, no one would ever be born again, for “there is none who seeks for God.” Moreover, if man must ultimately be given credit for coming to God, Christianity is turned into just one more of the world’s man-centered religions or cults which teach salvation by works. All such man-centered systems offer a false hope, for it is simply impossible for sinful man to make himself different than he is —he needs a new heart, he needs to be “born again!” Again, it should be stressed that we are certainly to tell men to seek God. We must tell them to believe and receive Christ. But these commands will fall on spiritually deaf ears unless God first generates life through the inward workings of His Holy Spirit. You may protest that this makes God the ultimate determiner of who is saved. To this the apostles and prophets with one voice cry, “Amen!” “Salvation is from the Lord.” Christians, as John puts it in the opening chapter of his gospel, are people, “who were born not…of the will of the flesh, nor of the will of man, but of God” (John 1:13). That’s why we give thanks to God when someone is converted. We know that God has graciously wrought a miracle —the sovereign, supernatural miracle of the new birth. This truth should give us confidence to present the pure gospel, knowing that it is not up to us to somehow maneuver and manipulate men into Christianity. It should also bring us to our knees before the God Who is sovereign in salvation. Only He can remove the heart of stone and give a new heart. Only He can give life to the dead. Only He deserves the blessing, glory, and honor.